Alcatraz Island provides a striking contrast to the tranquil San Francisco Bay. A looming penitentiary perched atop jagged rock, surrounded by clear blue water, which is more turbulent than it first appears. 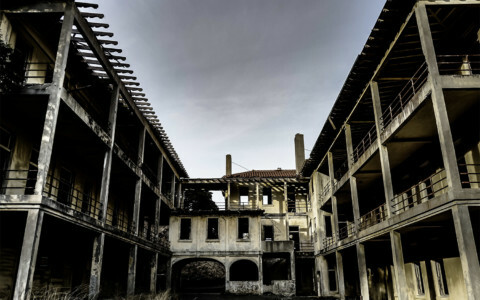 Ghost stories have been circulated about Alcatraz for many years, dating back further than the prison it is best known for keeping. Looking up at the exterior of the Alcatraz Federal Penitentiary building. Years before being inhabited, Native American’s from the Bay Area were aware of Alcatraz Island. 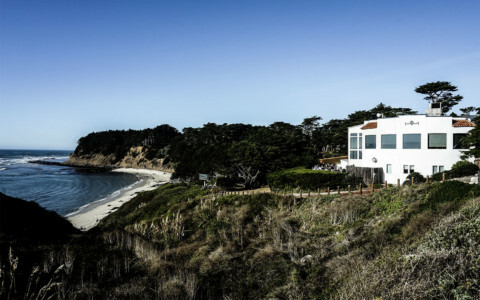 They referred to it as ‘Evil Island,’ and believed it was haunted by evil spirits. It wasn’t until much later in the 1800’s that the island received its first form of inhabitants, with construction work assembling a military fort and prison along with a lighthouse. As the American Civil War broke out (1861) the Alcatraz Island’s security was bulked up, with cannons and more fire power. It became a firearm storage base and went on to house many prisoners of war. It wasn’t until 1933 that the island became a federal prison and by 1934 the first batch of prisoners arrived. Alcatraz Federal Penitentiary was intended to house the worst of the worst. Focus was put into security, as rehabilitating these individuals was thought hopeless. The most violent and dangerous individuals were sent to Alcatraz, since they could not fit safely into a standard prison environment. 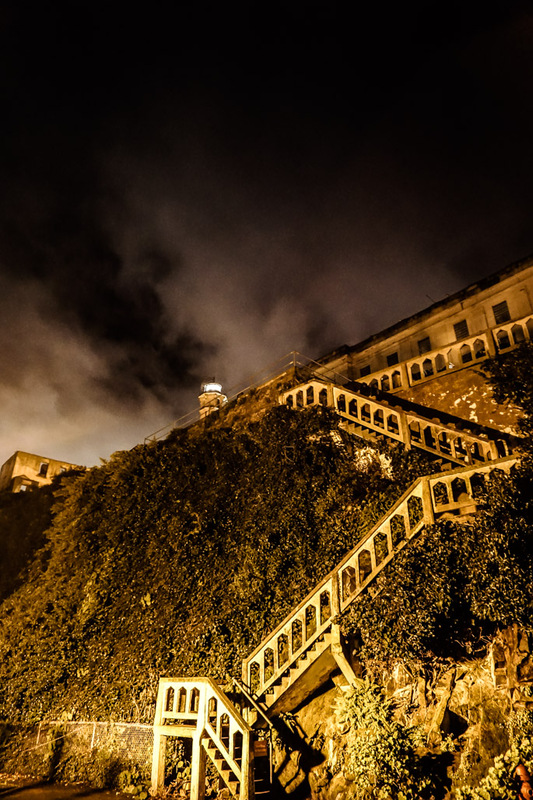 Stairs ascending to Alcatraz Federal Penitentiary with the lighthouse visible at the peak of the hill. 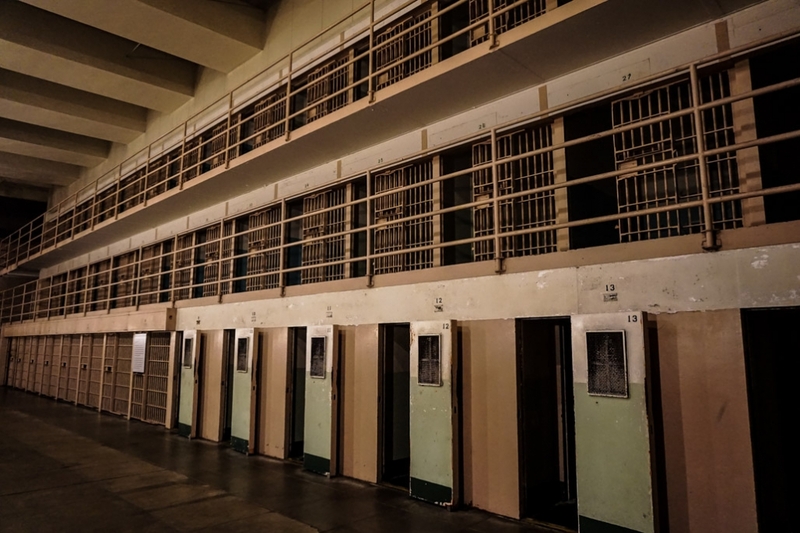 Word soon spread that Alcatraz was not a desirable place to serve time, as history shows the poor treatment and living conditions prisoners were subjected to. 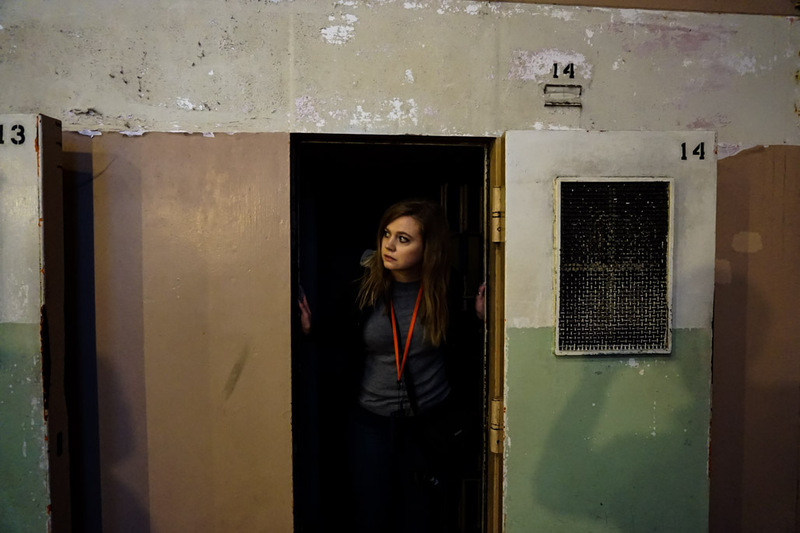 Torture, starvation and punishment were all apart of day to day life inside Alcatraz. Mixing that with the violence, murder and suicides, it’s no wonder there were so many escape attempts. During the 29 years that Alcatraz functioned as a Federal Penitentiary there was a documented 14 escape attempts made by 36 men. Of these, 23 were caught, six shot dead by guards, two confirmed to have drowned and five others presumed to have drowned, yet still missing. One of these failed escape attempts, escalated into a riot now known as the ‘Battle of Alcatraz.’ During this two day take over many were injured and sadly two guards were murdered. The remains of the Warden’s House, which suffered extensive fire damage. With so many desperate enough to risk their lives for the chance to escape Alcatraz, why then, are there so many ghosts reported to still hang around the island? The image of Alcatraz is synonymous with ghostly tales of former inmates. 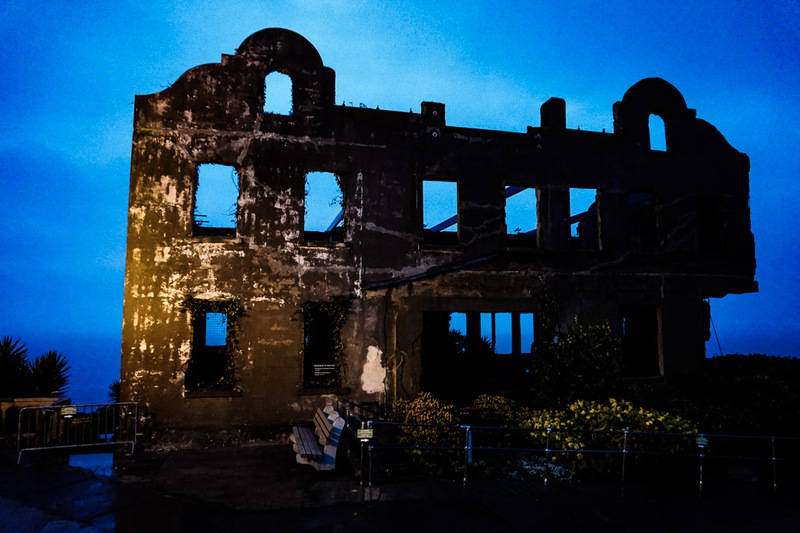 Many stories and reports of paranormal activity centering on Alcatraz island have been told over the years. Some of these date back to when the island was a functioning prison. 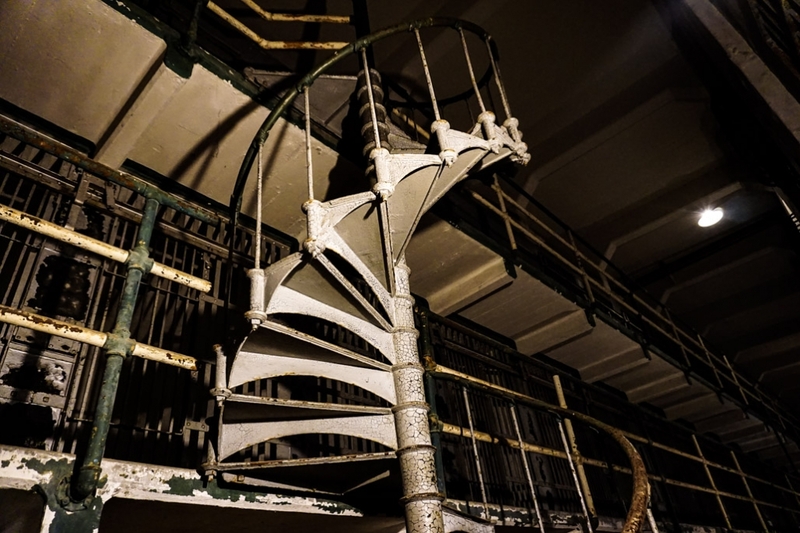 Looking up at the spiral staircase inside Alcatraz’s haunted A Wing, which dates back to the Civil War. Likely the most disturbing of any Alcatraz ghost story is set in the 1940’s. 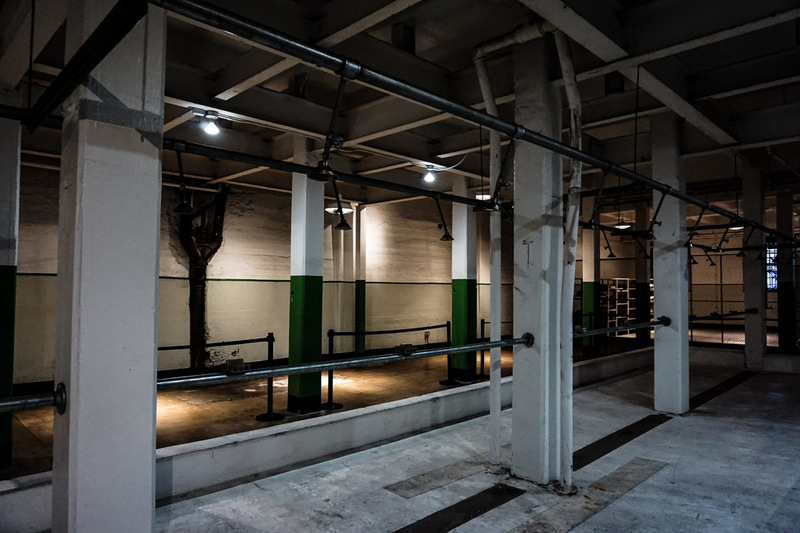 It is told that one night an unruly prisoner was sent to D Block, which was the area of the prison known as ‘The Hole.’ This saw the prisoner confined to solitary in a cold, completely dark cell. His behavior was concerned and erratic. Guards claim that he reported to believe there was an evil creature within his cell, sporting glowing red eyes and viciously attacking him. Guards were quick to dismiss this claim, putting it down to his lack of sanity. For many hours the prisoner continued to scream within the cell, until suddenly falling silent. The next morning this man was found dead. He had strange markings around his neck, dead of strangulation. Mystery surrounds this case as it was found that the man’s wounds could not have been self inflicted. Checking out the most haunted cell inside Alcatraz Federal Penitentiary. Cell 14D is haunted by a creature with glowing red eyes. 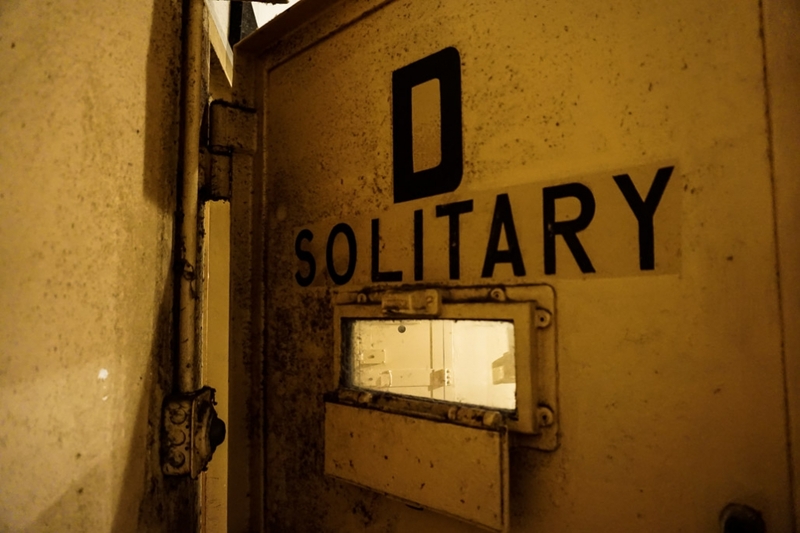 To this day his cell, 14D, remains one of the prison’s most eerie. There is an unsettling feeling within that area, one of dizziness and vertigo. It is always colder than any other cells around it and others have reported sighting those same glowing red eyes and figures made of black mist from within it. Looking down the now empty cell block D, which was used as solitary confinement when Alcatraz Federal Penitentiary was in operation. Many other spirits are thought to dwell on the island, including that of one of the penitentiary’s most infamous prisoners. Al Capone, one of American’s most notorious mobsters, is thought to continue serving time even in death. Capone is said to have slowly lost his sanity whilst at Alcatraz, a symptom of his syphilis. Guards have described how he would hide away in the penitentiary’s shower room instead of braving the yard, where he feared others would harm him. During this time he would practice playing the banjo. To the surprise of some, the ghostly sounds of a banjo playing from the empty shower room have been reported since Capone’s death. 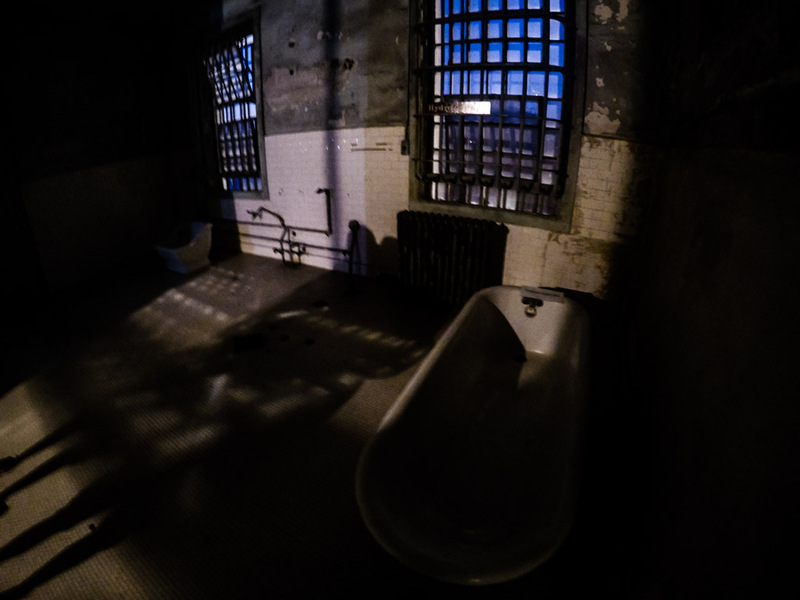 The shower area of Alcatraz Federal Penitentiary where Al Capone’s ghost is said to haunt. Another inmate continuing to serve time is that of Abie Maldowitz, affectionately known as Butcher. Maldowitz was actually brutally murdered in the laundry, yet continues to haunt C Block. Entry door to Cellblock D or solitary confinement in Alcatraz Federal Penitentiary. Other commonly reported spirits of Alcatraz island include that of a Native American male and Civil War era soldiers and prisoners. These ghosts are all thought to have passed away and or been buried on the island at one point in time. All have been reported by staff, inmates and even tourists throughout the decades. Part of the Alcatraz Federal Penitentiary hospital wing. Further reports of strange occurrences, commonly believed to be paranormal, exist. 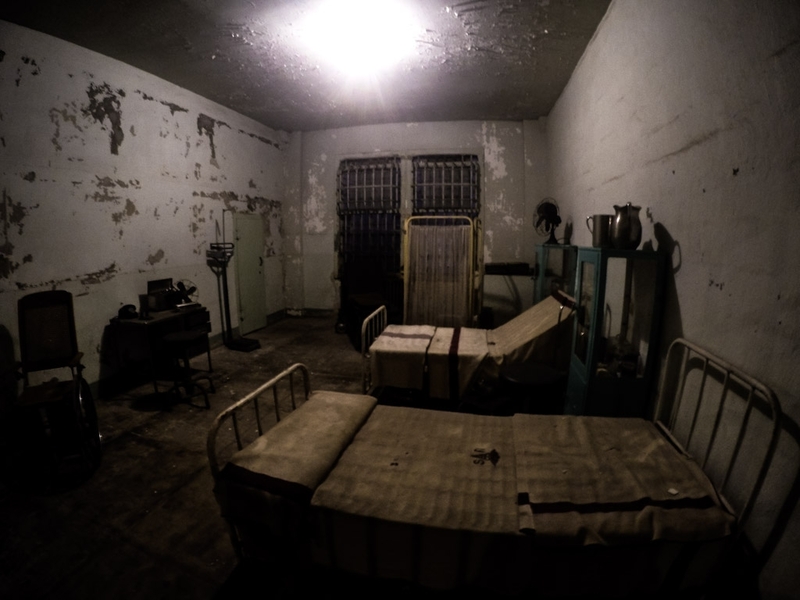 Many prisoners would complain of whispering noises and light anomalies during their stay. These same claims have continued to be reported to this day. The sounds of crying, screams, doors slamming, gunshots, clanging chains and footsteps are also frequently heard, yet no source for the sound exists. In addition, sudden temperature drops, phantom smells, shadow figures and apparitions have also been reported. Looking down the haunted Civil War wing, Cellblock A, of Alcatraz Federal Penitentiary. Today, Alcatraz is the most visited tourist attraction in Northern America. 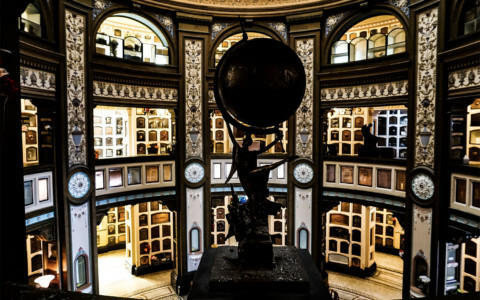 It is an exceptionally well preserved historic site and extremely interesting. Visitors are shepherded over by a ferry to follow an audio guided walking tour around the jail. They’ll walk the same path inmates did when they first arrived at the island and explore the main jail building, administration building and other areas which are open, permitting restorations. On my first visit I was able to explore the hospital wing. This area was off limits due to lead paint removal on my second visit, yet was compensated for by having Cellblock A open (civil war wing), which is generally closed. Hydrotherapy room inside the Alcatraz Federal Penitentiary hospital wing. This is an extraordinary experience for anyone interested in history and visiting the Bay Area. Unfortunately, for paranormal buffs, there is no information about hauntings told or on display at the museum. Park Rangers are also hesitant to talk about these topics, which is an image they are trying to steer away from. Nevertheless, don’t miss an opportunity to visit, I highly recommend the night tour. Take the last boat ride home to avoid the bulk of the crowd of visitors who tend to leave the island early. Looking up at one of the spiral staircases inside Alcatraz. 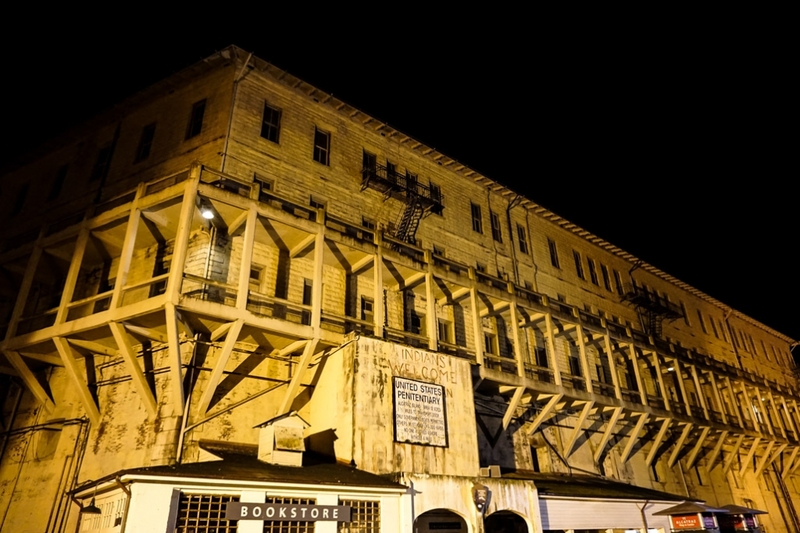 Want to learn about other haunted jails? 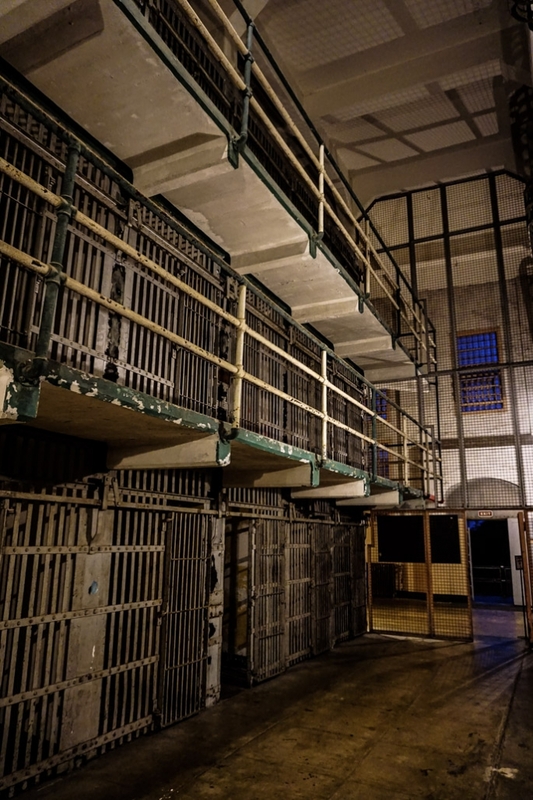 Check out the amazing Eastern State Penitentiary in Philadelphia. Loved this Amy! I went last summer, but unfortunately the night tour was sold out so I had to go during the day. I too noticed the guards were very hesitant to talk about the ghosts. Weird. Also, I hope it’s ok; I have linked this story to my blog about my visit. Hi Jenna – Thanks for the comment and the link back. Glad you enjoyed the article. 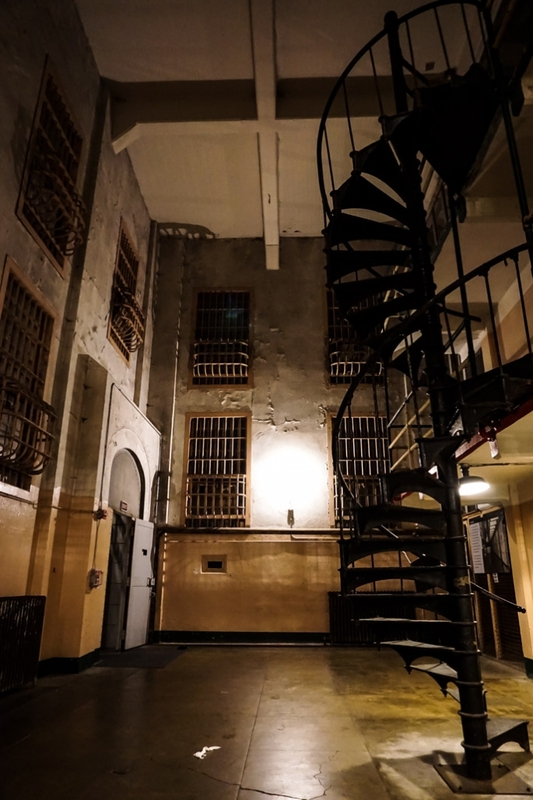 I also just uploaded a video about my trip exploring the ghost stories of Alcatraz. Let me know what you think. All content is copyright © 2019. Please do not re-post images or other content without permission. Contact me directly for licensing, collaboration or other business enquiries.